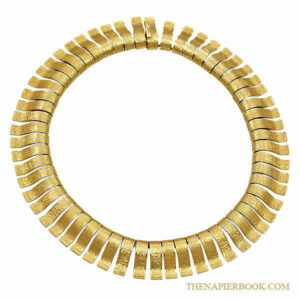 Gorgeous flexible link bracelet with open metalwork and high-domed cabochons plated with an “antique” gold plate finish. This Napier gold-plated faux carnelian cabochon bracelet was featured in 1964 by The Napier Co. The flexible link bracelet with brass die-stamped plaques with an “antique” gold plate finish surmounted by faux carnelian hard resin stones. The bracelet measures 7 1/2″ tl. V-spring and box clasp. A substantial and elegant piece! 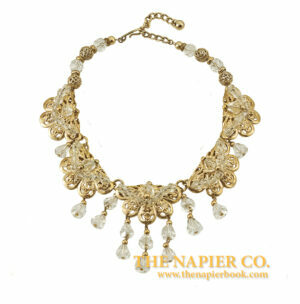 For more information of this collection, please go to page 373 of your Napier book.